It’s strange: I’ve been messing around with pistachio and rosewater combinations a lot too for a few days now, after deciding to pick up a big bag of shelled pistachios and a bottle of rosewater from a local Indian grocer. I’ve never used pistachio cream, though, and at that price I probably won’t in future – yikes! I just blitz the nuts until they’re finely ground and then use them as you would ground almonds. At the moment in my oven there is a cake made using creamed butter and fine sugar, eggs, equal amounts of powdered pistachios and almonds, the juice and zest of an orange, a tablespoon of rosewater plus a little bit of flour. I’m not sure if it’d translate well to cupcakes as it’ll be dense…about half an hour of baking still to go! I also like to make pistachio and almond cake without flour, using just powdered nuts, eggs, sugar, a little raising agent and puréed poached oranges or lemons. Chockylit – I saw your Vietnamese coffee cupcakes mentioned on the Food Section – Congrats! May is the month for roses! My rose bush has hundreds of blooms on it right now and this post is motivating me to try to make a rose syrup from them. I have tried Magliano’s organic rose syrup (I got mine at purelyorganic.com, but I think whole food is carrying it now)before and was blown away by it. It wasn’t at all flowery the way rose water can be but just tasted purely like a sweet rose. 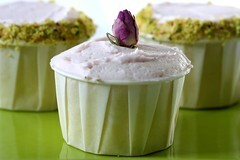 Between the rose syrup and the pistachio cream, though, this might be the most expensive batch of cupcakes ever!! I’d like to try pistachio cream, too, but I don’t know if I could achieve that texture even using a Vitamix. Do you have any experience with this? In my pistachio ice creams I use a very tiny amount of Frangelica just to bump up the flavor. It’s delicious! I’d love to play with a pitachio cupcake with cherry or saffron frosting. Ok, maybe not play with it- but eat it! One more time I’m soooooooo impressed ! How can you make so simple cakes that seem so exceptional !??? My problem is… I’ve been looking for some pistachio cream fot months now and haven’t been able to find any. Do you have a brand name that could help me in my quest ? Why not use ground pistachios instead of wildly expensive pistachio cream? What’s in the pistachio cream other than ground pistachios? So pretty! 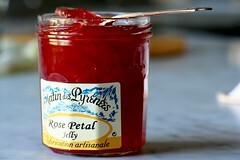 I’ve never used rose petal jelly before, only rose water. The colors are beautiful! chochotte, there must be pistachio in the air. yeah, i know there are lots of resources and options. they key for me was, i was darned pressed for time so one didn’t have time to shop around or shell and grind up a bunch pistachios. also, i am sure pistachio cream can be found cheaper. the ferry building is not cheap.. but grinding makes sense… i think the addition of almond flour sounds nice too. thanks, april, i have’t ever used vitamix. i will have to check it out. frangelica sounds great. i like that stuff. framboise, unfortunately, this is the first i have seen of pistachio cream. its an italian brand. so maybe start at italian grocery stores. hi, anonymous. yeah that is a fine idea. like i mentioned in the post, i was pressed for time and shopping on impulse. i did not have the time or patience to shell and grind pistachios on a thursday night. Looks awesome! How did you get that light batter into the cupcake papers? using a scoop, 2 spoons or pastry bag method? thanks! Just wanted to say that you can buy the same brand of pistachio cream that Chockylit used here, but believe it or not — it is even more expensive($21.99). 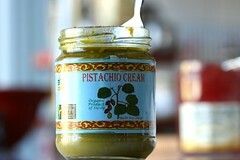 The pistachio cream (Stramondo brand) contains organic cane sugar as the only other ingredient. I’d say the difference between using the pistachio cream and using ground pistachios is texture and color(and a lot of time, of course, like Chockylit said). You can sift your pistachios finely though, and nearly eliminate that roughness that sometimes accompanies cakes made with nut flour. The bright green color of the nut butter that Chockylit used is because the pistachios are blanched and peeled before making them into butter. Learn to make your own pistachio butter here. Jessica, I used a 2 ounce ice cream scoop. It worked great. April, thank you so much for posting all that helpful information. those cupcakes look absolutely beautiful, they’re beckoning to me. Could you use the same batter to make a normal cake instead of cupcakes? I’m never really confortable with cakes that use beaten eggwhites. Your blog is awesome. You’re very creative in your cupcake baking/making/creating, and the photography is wonderful aswell. Can’t wait to try some of these . . .
Mmm I understand about being pressed for time! In future, I’m sure you have your own favourite suppliers – but I do find that Indian grocers are the best for interesting ingredients – I got a bottle of rosewater for 99p/$1.80 (they were charging five times that much in a local deli) and 18 ounces of shelled pistachios for £5/$9. In fact it was even cheaper than that seems, to be honest, because the exchange rate is so crazy at the moment. mm…pistachio and rose, sounds lovely! Hi Chockylit – everything you make is beautiful but I’m intrigued by this combination. I’ve found the paper moulds (yay!) so am looking forward to trying some of your recipes – I know mine won’t be as beautiful as yours though! Thank you for the inspiration, as always. very pretty. you’ve got me excited bout cupcakes…. and i love your experiments with different flavours and textures. great blog!! That flavor combination is simply divine! Those are beautiful cupcakes (as are all your cupcakes). This blog is really dangerous for me- I always leave salivating, heh. These look absolutely divine. Even with the price of the pistachio cream considered, I may just run out and get some. Thanks for inspiring me and giving me a new favorite dessert! I baked the pistachio cupcakes with my 7 years old daughter (future pastry chef btw). She was constantly asking me: Do I like pistachio paste??? I told her: I’ts like peanut butter but green!. At the end she loved the cupcakes. There is a web site http://www.bakerscatalogue.com. They have an All-Natural Pistachio Paste – 11-oz – $9.25. Not that bad! Love your recipes, photos and comments. Keep it up girl! wow. a bit curious though, does pistachio cream taste like peanut butter sorta? i’ve never tasted it and now i’m all geared up to find pistachio cream too! ur cupcakes look absolutely lovely, something perfect for summer. light, fun & pretty. actually, my husband tried to use it like peanut butter… he said it tasted exactly like ground up pistachios. it’s pretty sweet, a little grainy, and kind of oily. These look & sound amazing. I just discovered your blog and am loving it! sounds delicious! I make ice cream with the same flavours and it is wonderfull. 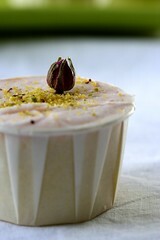 Ground pistachios, rose water and ground cardamom. i have been visiting your blog for a while but this is my first time commenting. this looks delicious, i will try and source some pistachios cream and try it. i recently made pistachios cupcakes with pistachios grounded, rose water and white chocolate and varied it once with matcha green tea instead. Sur La Table and The Baker’s Catalogue both sell a rose extract that might be more rosey than the jam or rose water. I love reading your blog. Was inspired by your pistachio cupcake recipe, but was so pressed for time, I ended up using a box white cake mix and pistachio pudding. Used rose water as my frosting flavoring. Even then, it came out great with all the butchered modifications. What a great flavor combination. Everyone loved the flavors.